I'm calling it an album quilt, but it's not really that - I guess it's more of a sampler? I got my inspiration to make this from a quilt I pinned on Pinterest a while back. I love finding quilt inspiration from Pinterest ;) when I followed the source of the image for an interiors site, they called it an antique album quilt - so that's what I'm naming it! :) I loved the antique quilt hanging over the fireplace, I thought it looked so beautiful and striking. I have a square alcove in the centre of my living room and it's the first thing you see when you come into the room, at the moment there is only a small clock that sits in it, so I thought this quilt would make a fabulous statement! I chose a range of deep reds, muted greens, browns and beige to make up each of the blocks and I really love how they all blend together. A step away from my usual bright and pastel colour choices, but I'm completely in love with how it's turning out!! I don't know whether to machine or hand quilt it? As you may know already, I'm going to Fat Quarterly retreat this weekend, and one of the classes I'm doing is hand quilting - so I'm leaning towards taking this with me to hand quilt at the class. Or the other class I'm doing is free motion quilting; although I won't be taking this to practise on! I don't know whether I should wait and then try some free motion on this at a later date? I'm thinking this is quite small, measuring 32.5" square so it would be a nice size to hand quilt. It's beautiful! I think it really lends itself to hand quilting! I'm working on something similar for my aunt but darker solid with a chocolate background but at queen sized it will be getting some FMQ! Hand quilting! That's my vote. 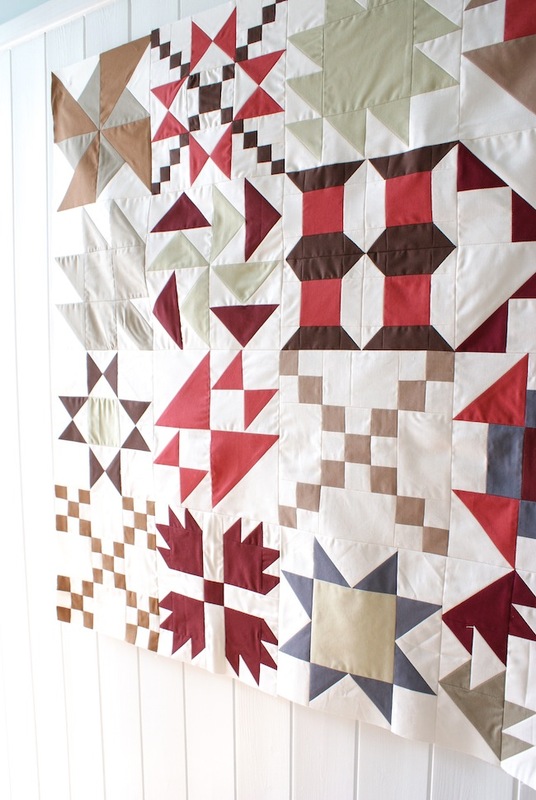 Of course, I'm a bit partial to hand quilting but in all honesty, I think hand quilting would do the most to enhance your blocks. Because it's going to be hanging, the added texture and the interest that creates will make it even more eye catching. 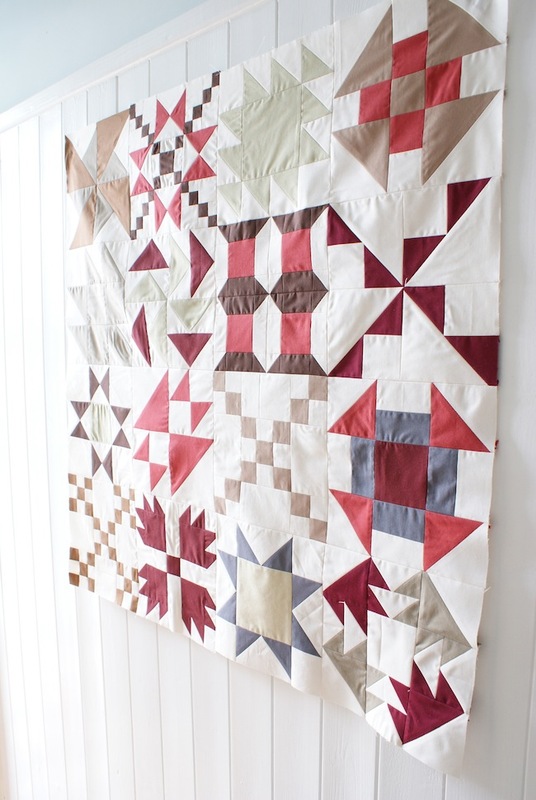 I'm definitely in agreement to hand quilt this beauty! It is the perfect size to manage and would look lovely with pretty coloured hand stitches! Tough choice but I'm sure it will look wonderful either way. hi jessie, its guilt free susan here ! first thanks for the red and white stripe - you must think me an awful fool for the confusion over the pink and white. your fast service is brilliant, none better or friendlier. the antique album is lovely and perfect for hand quilting. i make the whole quilt by hand, pieceing and all. i find machine sewing stressy and always end up with sore shoulders. that said i will machine piece the scrappy trip. hand sewing a whole quilt is soothing and when i look at ones i made a year or so ago i am amazed myself that i did it. i am slowly making one for each of my 5 children, now all grown and flown and so far i've done 3....and they are well used and loved. a bit too well used in some cases. nick brought his back at weekend having had a nose bleed on it ! eek ! i think you were brave to put the photo up, i HATE to have my photo taken and always look dreadful, you however look dreadfully pretty ! who knew a stitcher could be such a beauty? Oh gosh, what a pretty quilt! I am adding my vote for hand quilting. What a beautiful quilt! I would hand quilt it for sure since it's small and would show the stitches beautifully. It looks lovely !! Hope you had fun at your retreat! Thanks for leaving a comment on my blog today. As you are a No Reply Blogger, I thought I would pop over to yours to reply. It was great to meet you at the Retreat too. Looking forward to seeing how you quilt your wonderful top. beautiful. love your solids. i vote handquilt too! You are beautiful....don't be camera shy! Hand quilted in baptist fans would be wonderful.. Even in big stitch with perle cotton would be very effective.